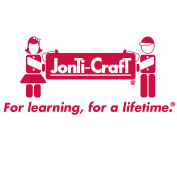 Jonti-Craft is a production leader for daycare and preschool furniture, with a wide variety of creatively designed products for the early childhood market. Children's furniture by Jonti-Craft are available in several lines to best suit your educational classroom for the young. Their classic Birch line comes with their KYDZTuff finish that resists stains, won't yellow, easy to clean and is as tough as the coating used on gym floors. Popular birch furniture by Jonti-Craft includes their Chairries chairs, ladderback chairs, KYDZ activity tables, sensory tables, and wooden changing tables. 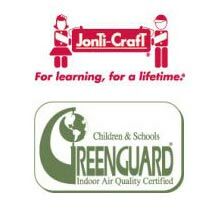 For a pop of color in your toddler's classroom, Jonti-Craft offers their Rainbow Accents furniture line. Rainbow Accents furniture feature thermo-fused edge banding in a rainbow of kid-friendly colors for a bright and long-lasting finished look. Jonti-Craft's Rainbow Accents are available on most of their furniture designs including mobile fold-n-lock storage units, bookcases, activity tables, and wall mounted coat lockers. Jonti-Craft's last line is their MapleWave furniture that has the warmth of wood, but the ease or laminate. MapleWave laminate recreates maple's beautiful grain patterns and coloration with leading edge technology. Jonti-Craft's MapleWave line is an economical option to match existing birch furniture with options such as Clean Hands portable sink units. Whether you need storage cubbies, daycare storage units, children's art room furniture or dramatic play and sensory tables, Jonti-Craft has the quality furniture you need and your kid's will enjoy. As an added convenience, most Jonti-Craft furniture ships out within 10 days, is made in the USA and comes with a lifetime warranty.